Effective communication and interpersonal skills are crucial to increase employment opportunities and to compete successfully in the business environment. The real key to the effectiveness of professionals is their ability to put their domain knowledge into effective practice. In this context, soft skills have a crucial role to play. If future managers know how to deal with people at the emotional level (peers, subordinates, superiors, clients, suppliers, etc.) through Emotional Intelligence (EI), they can build and sustain effective relationships that will result in mutual gain, providing a unique opportunity for all students to develop their personality and upgrade their communication and presentation skills. The training benefits the students, both in their early professional careers and in their social interactions in the business environment. Soft skills provide students with a strong conceptual and practical framework to build develop and manage teams. They play an important role in the development of the students’ overall personality, thereby enhancing their career prospects. 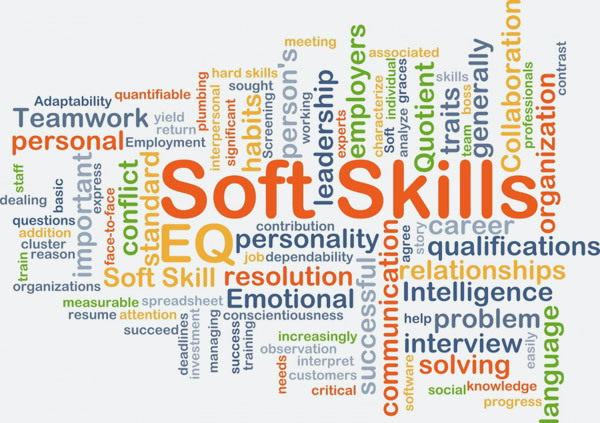 The soft skills training provides strong practical orientation to the students and helps them in building and improving their skills in communication, the effective use of English, business correspondence, presentations, team building, leadership, time management, group discussions, interviews, and inter-personal skills. This training also helps students in career visioning and planning, effective resume writing and dealing with placement consultants and headhunters.